Sumter and Surrounding Counties potential and excellent qualities for industrial development are surpassed only by its natural beauty, comfortable lifestyle and high quality of life. Strategically located at the "CROSSROADS" of our two state's major highways, Interstate 75 and Florida's Turnpike providing non-stop access to Orlando, Tampa, Miami, Tallahassee and Jacksonville. Attractive to industries interested in expanding or relocating. Offering the serenity of country living, excellent schools and shopping areas, scenic beauty great fishing and golf, all of which combine to ensure a quality lifestyle. 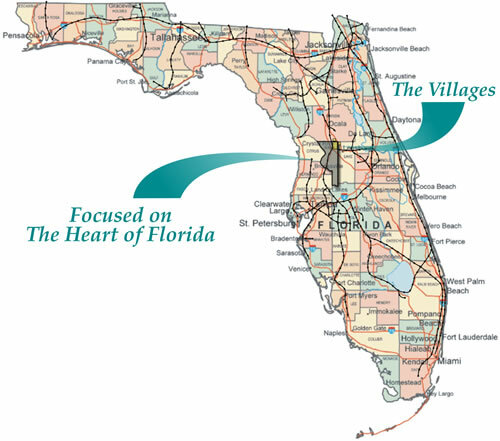 Located in the heart of Florida is the largest single-site real estate development in the USA, known as The Villages. With the diversity and affluence of this steadily growing community of approximately 80,000, The Villages has earned the #1 ranking as the fastest growing micropolitan area in the nation. Danny Smith & Billie Faye Smith - Co Owners of Smith & Smith Realty have been serving The Heart of Florida in Real Estate Brokerage the since 1997. The Smith's have strong ties to Sumter County where their office is located. Also, they are proud to actively represent Buyers & Sellers in surrounding counties. Smith & Smith Realty's creative marketing and local knowledge of the area have made them known as respectable leaders in the Real Estate Industry. The Heart of Florida could be defined as a different geographic region depending on who you may ask. We define it as the central part or "Hub" of Florida. From a transportation point that would be the City of Wildwood. The Heart of Florida extends beyond Wildwood and crosses several county lines to include a sixty mile radius where its edges' touches Gainesville to the north to Tampa to the south and Orlando to the east. In the identified market area for 2010 has a population of 4,718,678 and over 190,000 Businesses and around 2,000,000 Employees. To see a full report go to 20 40 60 miles. Smith & Smith Realty is focused on The Heart of Florida. When working with Sellers we focus on a 30 minute drive time. Real Estate is local and we strive to be the local experts of this fast growing region. This is our listing area and it has a population of 263,686 and 9,446 Businesses, 83,960 Employees as of 2010. Our listing area is one of, if not the fastest growing areas in the nation. To see the full report on 30 min drive times go to 30 min drive time. When working with Buyers, we cover the State of Florida, but within an hour drive is our focus. Within an hour drive the population is 2,000,203 and we have 81,779 Businesses and 886,009 Employees as of 2010. To see the full report on1 hour drive times go to 1 hour drive time. With nearly 100,000 seniors calling The Villages and Sumter County home, The Villages is called "Florida's Friendliest Home Town," and projected to soon be "America's Healthiest Hometown." Now the largest single-site residential lifestyle community in the U.S., spanning 26,000 acres (5.6 sq. mi. ), directly employing 12,000 people, with average residential income of $93,000, more than double the U.S. average, it is perceived to be a national model for senior healthcare. The senior health and medical research opportunities have attracted multiple higher education institutions, such as University of South Florida, Florida A&M University, University of Central Florida and Lake-Sumter Community College. The Villages area signed 50 new business leases and pulled 2044 building permits, compared to 26,636 permits statewide, recording 8% of all permits in the State of Florida. In 2008, The Villages was the fastest-growing Micropolitan Statistical Area in the U.S., and Sumter County was the 2nd fastest growing Florida housing market from 2000 to 2008, and the nation's 4th fastest growing over the past 6 years in terms of baby-boomers. Source: U.S. Bureau of the Census, 2000 Census of Population and Housing. Esri forecasts for 2010 and 2015. Sumter County Economic Developer, e5solutions.